Today’s post is from Gregory Paw (a partner in Pepper Hamilton’s white collar practice group, and a senior consultant to Freeh Group International Solutions). Paw has spent much of the past 18 months working on an extended project in New Orleans and enjoying the rich cultural heritage of the city. He lives in New Jersey, and has a great deal of empathy for those who must endure corruption jokes about the place they call home. White collar practitioners from around the nation are gathering in New Orleans this week for the annual ABA White Collar Crime meetings. A few blocks from the hotel hosting the ABA meetings sits an ornate building of unique importance to the FCPA. Behind the fruit-filled cornucopia carved into the doorway, the United Fruit Company built a lucrative early 20th century empire trading in tropical fruit grown on Latin American plantations and sold in the United States and Europe. Called “El Pulpo” (“the Octopus”) for having its “tentacles into everything,” the company came to control vast territories and transportation networks in Central and South America as it turned the banana into a mass-market product. United Fruit altered both the physical and social landscapes – deemed “la hojarasca” or “the leaf storm” by García Márquez – of the nations where the company harvested. In the process, the company developed a virtual monopoly in what O. Henry called the “banana republics,” and even managed Guatemala’s postal service and its Tropical Radio & Telegraph Company. The company moved its fruits on a “Great White Fleet” of steamships, which called the New Orleans port its home and even offered luxurious tourist accommodations to several Caribbean destinations. The fleet’s flag can still be seen today on a popular taxi cab line operating in town. United Fruit was rumored to have been involved in the 1954 coup in Guatemala, with the story fanned in part because Secretary of State John Foster Dulles had negotiated land deals for the company while practicing law, and CIA Director Allen Dulles did legal work for United Fruit and sat on its board. Walter Bedell Smith, CIA director until 1953 and Under Secretary of State at the time of the coup, also later served on the board. Corporate raider Eli Black targeted United Fruit in the late 1960s with a $40 million open market purchase of 733,000 shares of company stock. Black later merged United Fruit into a conglomerate, renamed United Brands. Already hurting from tight competition, the company suffered further loss when Hurricane Fifi destroyed the Honduras banana crop in 1974. The next year, Black committed suicide by jumping from his office on the 44th floor of New York’s Pan Am Building, as the Securities & Exchange Commission was investigating a scheme by the company to bribe Honduran officials in exchange for a tariff reduction. United Brands later argued that the Honduran payment “had been agreed to by prior top management of the company” and was a “unique aberration” rather than part of a pattern. A federal judge in Manhattan imposed a $15,000 fine against the company. Yet the publicity of the incident, combined with similar issues unfolding at other American corporations, caught the attention of a post-Watergate Congress. As explained by Professor Koehler’s excellent 2012 article, in 1975, Congress began a series of hearings on foreign bribery by U.S. companies that culminated two years later with the passage of the Foreign Corrupt Practices Act. Long converted the Roosevelt Hotel into the hub of Louisiana politics in the late 1920s and early 1930s. From an opulent 12th-floor suite that served as his unofficial governor’s residence and Senate office, Long befriended a one-time hotel barbershop manager, Seymour Weiss, who was rising rapidly in the hotel’s operations and would later become its owner. Weiss grew to become a trusted Long advisor. Long made legendary use of state patronage during his tenure, and is said to have required some beneficiaries of bureaucratic employment to return a portion of their salary back to Long’s political machine. Payments were to be placed in a brass “deduct box” safeguarded by Weiss and said to hold as much as the modern equivalent of a million dollars at a time. Before Long left the Roosevelt for Baton Rouge on the September 1935 day that he was assassinated, Weiss was rumored to ask about the location of the deduct box. “I’ll tell you later, Seymour,” Long said as he departed the hotel. The deduct box purportedly was never found, but a replica sits today in the Roosevelt lobby. Some say that the Sazerac Bar’s wood panels still bear bullet fragments from a stray shot originating from one of Long’s bodyguards. While this story has dubious historical support, the Roosevelt has confirmed that its basement contains a “mysterious jail cell” inside of a steel vault. The cell allegedly no longer locks, which may be good news for conference goers who wish to sample some of the “real thing” at the Sazerac Bar. Former U.S. Representative William “Dollar Bill” Jefferson, the first U.S. public official charged with an FCPA violation, represented Louisiana’s Second Congressional District, which includes a large portion of the greater New Orleans area. Perhaps best remembered for storing $90,000 in cash from an FBI sting in the freezer of his home outside of Washington, Jefferson also holds a unique place in New Orleans history. Rising from the poverty of one of Louisiana’s poorest parishes, Jefferson went on to earn a Harvard law degree and become Louisiana’s first black Congressman since Reconstruction. In the House, he came to occupy a key position on the Ways and Means Committee. A month before Hurricane Katrina devastated New Orleans, the FBI searched Jefferson’s Virginia home. The same day, agents also searched Jefferson’s residence in New Orleans’ Garden District. As later revealed at Jefferson’s criminal trial, an FBI agent testified that the nine-term Congressman tried to hide some documents during this search of his home on Marengo Street. The agent said Jefferson asked for a copy of the subpoena, which she watched him take and fold in with “other papers” and then tuck under his elbow. The agent later confronted Jefferson, who is said to have then turned over the papers, which included a fax from a person whose name also was listed on the government search warrant. But Jefferson also cooperated with the FBI agents while they searched his home, and even went so far as to find a locksmith to help open a safe for which he had lost the combination. He learned from the agents that day that the cash in his freezer had come from the FBI, and even watched a video of himself carrying a red bag filled with the marked bills from a government cooperator’s car trunk. A month later, Jefferson was in New Orleans during the chaos following Katrina. Jefferson sought to tour the affected portions of his district, and a National Guard unit prepared a military truck to accompany him on the trip through the flooded and dangerous streets. Troops later said that Jefferson asked that the truck take him to Marengo Street to see his home, where water still reached the steps. Sources said Jefferson went into his home and later emerged with a laptop computer, three suitcases, and a box “about the size of a small refrigerator,” all of which were loaded onto the military truck. Asked if he received a privilege not available to most, Jefferson told local reporters, “If you were an elected or appointed official, you would have been escorted around town.” Jefferson also said the items he retrieved belonged to his children, and had no connection to the search warrant. The National Guard noted that they had provided assistance getting around the New Orleans area to a wide range of officials, including President Bush. After a 2009 trial in federal court in Virginia, a jury acquitted Jefferson on the obstruction of justice charge arising from his alleged acts at his New Orleans home in August 2005. The jury also acquitted Jefferson on the FCPA charge arising from the transfer of the cash recovered from his freezer. But the jury convicted Jefferson on 11 other counts, including conspiracy to solicit bribes and money laundering. He was sentenced to 13 years in prison. The stop on Marengo Street leaves the visitor within a few blocks of Commander’s Palace, a New Orleans landmark and former home to chefs Paul Prudhomme and Emeril Lagasse. The restaurant is a perfect place to have a drink, observe the pace of the city and reflect on the unique history of this special place in America. Enjoy, and make sure to keep away from the jail cell at the Roosevelt! This week’s disclosure, Jefferson’s non-FCPA appeal, statistics of note, and an update on Brazil’s “FCPA”. It’s all here in the Friday roundup. Minnesota-based MTS Systems Corp. (here), a global supplier of test systems and industrial position sensors, disclosed earlier this week (here) as follows. I respectfully disagree with others who have recently stated that the 4th Circuit upheld former Congressman William Jefferson’s FCPA conspiracy conviction. Yes, the 4th Circuit did affirm Jefferson’s conviction of Count 1, as well as other charges. Count 1 was a conspiracy charge to solicit bribes, commit honest services wire fraud, and violate the FCPA in violation of 18 USC 371; however, as even the 4th Circuit noted in its opinion – here, this count charged a conspiracy with multiple objects and the jury was instructed that it only had to find that Jefferson conspired to commit one of the substantive offenses identified. In announcing the jury verdict the court did not specify which object of the conspiracy the jury agreed on and in fact the jury found Jefferson not guilty of a substantive FCPA charge, a charge principally based on allegations that Jefferson attempted to bribe Nigerian officials (including the former Nigerian Vice President) to assist himself and others obtain or retain business for a Nigerian telecommunications joint venture. As stated in the 4th Circuit’s opinion, Jefferson appealed his convictions on the following grounds: “(1) that an erroneous instruction was given to the jury with respect to the bribery statute’s definition of an ‘official act’; (2) that another erroneous instruction was given with respect to the ‘quid pro quo’ element of the bribery-related offenses; (3) that Jefferson’s schemes to deprive citizens of honest services do not constitute federal crimes; and (4) that venue was improper on one of his wire fraud offenses.” [Reference to the “bribery statute” is to 18 USC 201 – the domestic bribery statute, not the FCPA]. In short, Jefferson’s 4th Circuit appeal had nothing to do with the FCPA. In “Revisiting a Foreign Corrupt Practices Act Compliance Defense” (see here), I argue that a compliance defense will better incentivize corporate compliance, reduce improper conduct, and thereby advance the FCPA’s objective of preventing bribery of foreign officials. Sure, business organizations at present have at least two incentives (the DOJ’s Principles of Prosecution of Business Organizations and the U.S. Sentencing Guidelines) to implement FCPA compliance policies and procedures. I argue that these incentives are not well known by a meaningful segment of the business community and, even if they were, despite these incentives (incentives which merely lessen the impact of legal exposure vs. reduce legal exposure), few business organizations operating in a world of finite resources are sufficiently implementing comprehensive FCPA policies and procedures. Various survey data is cited in support. Add Deloitte’s recent third-party business relationships poll (see here) to the list. Despite the fact that a significant majority of corporate FCPA enforcement actions are based on the conduct of foreign third parties (such as agents, representatives, distributors, joint venture partners) the poll found the following. On what percentage of your organization’s third-party business partners do you estimate it performs due diligence and risk assessments? An FCPA compliance defense surely will not cause 100% of business organizations to perform due diligence and risk assessment of all foreign third parties, but it is reasonable to conclude that an FCPA compliance defense will better incentivize more robust FCPA compliance policies and procedures, including as to third-parties. Another statistic of note. A recent Global Anti-Corruption Survey by AlixPartners found that 95% of survey participants believe their industry is exposed to business practices that may constitute corruption. Southeast Asia and Africa presented the most significant risk according to survey participants. Survey participants were in-house legal counsel or compliance officers at North American multinational companies with annual revenues of $250 million or greater (with 90% of respondents working for companies with annual revenues exceeding $1 billion). In this prior post, Matteson Ellis (founder and Principal of Matteson Ellis Law, PLLC, who also writes the FCPAmericas Blog), provided an overview of a draft bill making its way through the Brazilian Congress that would strengthen its “FCPA-like” law. In this recent post on his FCPAmericas Blog, Ellis provides an update on the draft bill. Ellis reports as follows. “A Special Committee created by the Brazilian Congress to analyze [the draft bill] has recently presented a revised draft that bolsters certain key provisions and keeps other significant ones the same. The House aims to vote on the legislation before July 2012.” In his post, Ellis provides various highlights of the revised draft bill as to corporate liability, sanctions, voluntary disclosure, and compliance programs. In a prior post (here), I noted that in 2009 there were three FCPA trials – Frederic Bourke, William Jefferson, and Gerald and Patricia Green. I then posted the question – what is the common thread in these three FCPA enforcement actions – a fact which speaks to the great difficulty individual FCPA defendants generally have in mounting a legal defense? Before the answer, the background. Individual FCPA defendants tend to work for companies. Under respondeat superior theories of liability, the company is going to have a very difficult time “distancing” itself from its employees conduct. Thus, all corporate FCPA enforcement actions tend to be resolved through a non-prosecution agreement, a deferred prosecution agreement, or a plea. Entering into one of these resolution vehicles is often easier, more cost efficient, and more certain than actually mounting a legal defense based on the FCPA’s statutory elements. Further, because these resolution vehicles are subject to little or no judicial scrutiny and are entered into the context of the DOJ possessing certain “carrots” and “sticks” they do not necessarily reflect the triumph of one party’s legal position over the other. While these resolution vehicles may indeed avert “another Arthur Anderson” here is the problem. “Defendant admits,agrees and stipulates that the factual allegations set forth in the Statement of Facts […] are true and correct, that it is responsible for the acts of its former officers and employees described in the Statement of Facts, and that the Statement of Facts accurately reflects CCI’s criminal conduct” (see Control Components Inc. Plea Agreement here). So what can you do if you are the targeted employee of such a company? More likely than not, your employee has already terminated you (even before all the facts may be known) to demonstrate to the DOJ that it is implementing “prompt remedial actions” – a factor DOJ will consider when making its charging decision (see here). Then, because of the resolution vehicle your employer entered into to make the DOJ go away, you are stuck with your employer admitting and accepting responsibility for your misconduct, even though there has been no finding that your conduct was even misconduct. Against this backdrop, it is no surprise that nearly all FCPA individual defendants plead. What choice do they really have? So that brings us back to the quiz answer. Perhaps it was pure coincidence, perhaps not, but the three individual FCPA trials all occurred in the context of there being no parallel NPA, DPA or plea with a corporate entity. In August 2009, former Congressman William Jefferson (D-LA) was found guilty by a federal jury of a variety of charges (solicitation of bribes, honest services wire fraud, money laundering, racketeering, and conspiracy). The jury found Jefferson not guilty of a substantive FCPA charge, a charge principally based on allegations that Jefferson attempted to bribe Nigerian officials (including the former Nigerian Vice President) to assist himself and others obtain or retain business for a Nigerian telecommunications joint venture. 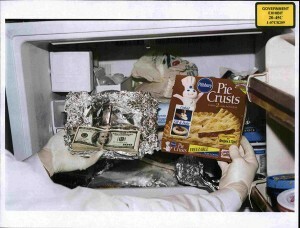 The famous “cash in the freezer” was allegedly part of the bribery scheme. (See here for prior post). Just what conspiracy charge the jury found Jefferson guilty of was unclear. The indictment charged conspiracy to solicit bribes, to commit honest services wire fraud, and to violate the FCPA. Problem is, the jury was instructed, that to convict on this charge, it only needed to find Jefferson guilty on two out of three of those counts. In announcing the jury verdict, the court did not specify which counts the jury agreed on (see here and here). These anonymous juror statements, while clearly not official in any sense, may shed some light on Jefferson’s FCPA verdict. For instance, why didn’t the jury convict Jefferson of the substantive FCPA offense? What about the conspiracy conviction – did that conviction include conspiracy to violate the FCPA? According to the jurors comments – yes. In November 2009, Jefferson was sentenced to 13 years in federal prison. He remains free on bail while his appeal is pending. The Africa Sting case is indeed the largest and most dramatic use of pro-active, undercover investigative techniques in an FCPA investigation. However, contrary to numerous reports and even statements attributed to DOJ officials, the Africa Sting case is not the first time that pro-active, undercover investigative techniques have been used in an FCPA investigation. In other words, this is not a new development as demonstrated below. In September 2008, Shu Quan-Sheng (a naturalized U.S. citizen and President, Secretary, and Treasurer of AMAC International (“AMAC”), a high tech company located in Virginia with an office in Beijing, China) was charged in a criminal complaint (see here and here) with, among other things, offering bribes to Chinese “foreign officials” in violation of the FCPA. An affidavit (see here) in support of the criminal complaint by an FBI special agent describes several pro-active, undercover investigative methods including court authorized electronic surveillance and physical surveillance. Among other things, the affidavit describes several phone conversations Shu participated in connection with the bribery scheme. Shu plead guilty to FCPA violations (among other charges) and was sentenced to 51 months in prison. (see here). In January 2008, Gerald and Patricia Green, owners and operators of Film Festival Management (a private Los Angeles based private entertainment company) were criminally indicted for conspiring to bribe an official with the Tourism Authority of Thailand (TAT) and for making improper payments to the TAT official in violation of the FCPA. (see here and here). In September 2009 (see here), the Greens were found guilty by a federal jury of substantive FCPA violations, conspiracy to violate the FCPA, and other charges. The Greens are scheduled to be sentenced in March 2010. In June 2007, then U.S. Congressman William Jefferson was criminally indicted (see here and here). The charges included substantive FCPA violations and conspiracy. According to numerous media sources (see here), the FBI affidavit released in connection with the investigation describes several pro-active, undercover investigative techniques including cooperating witnesses wearing FBI wires and video surveillance. In August 2009, Jefferson was acquitted of substantive FCPA charges by a federal jury, but convicted of a wide range of other charges. (see here for more on the Jefferson case). In November 2009, Jefferson was sentenced to 13 years in prison and he remains free on bail pending his appeal. WrageBlog (see here) has also identified two other previous instances of pro-active, undercover investigative techniques employed in connection with FCPA investigations.